We got up and had a nice Irish breakfast at Lough Owel Lodge. A problem that was common throughout our trip, the only coffee available was instant. I know, I know - when in Rome, do as Romans do...when in Ireland or the UK, drink the tea. So on our way through Mullingar, we stopped at "The Bakery" which was done up like any modern city coffee house. There they had a proper coffee, which goes to show how universal the saturation of coffee culture is. Is this a good thing? On one hand, it's a little bit of a triumph of the banal - recessed lighting, pastel and earth-tone colors, forgettable artwork and a cafe latte are the same all the world over. On the other hand, I can get coffee. Suitably fed and caffeinated, we made our way to the Mullingar pewter factory. The town of Mullingar is mostly famous for its pewterworks (and not the Bacon Store - there ain't no justice!) and there's a factory store along the big motorway. Unfortunately we weren't able to take a tour of the factory itself, but the store was open, and we picked up thank you gifts for many of the people who helped us make our wedding a success. I lusted after some of the more elaborate stuff there, too. We got on the road. 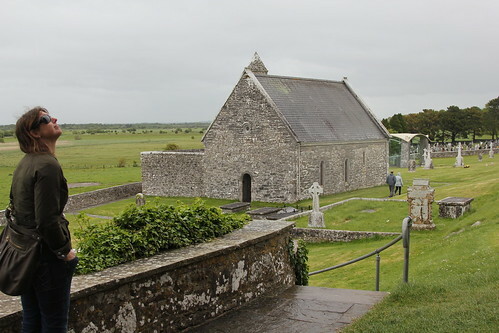 And off the main motorway, looking for an historical site called Clonmacnoise. 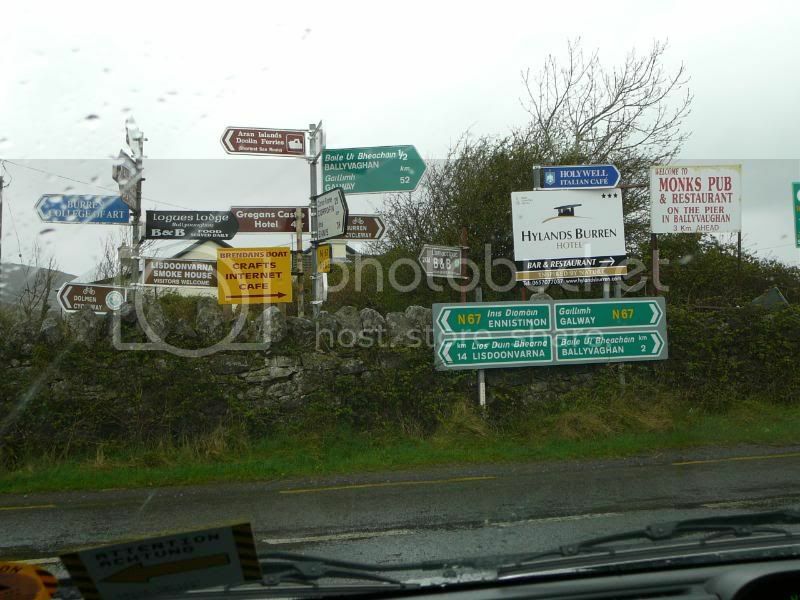 Driving in Ireland is a serious white-knuckle affair. The roads are so narrow that two cars can't pass comfortably. There is not a single street sign in the entire Republic. Curves are frequent and blind. There are banks in the roads so it is difficult to pull off to allow an oncoming vehicle to pass. Plus, i was driving on the wrong side of the road, in a manual shift on the wrong side of the car. All together, I was basically lost and terrified the entire time we were in motion. 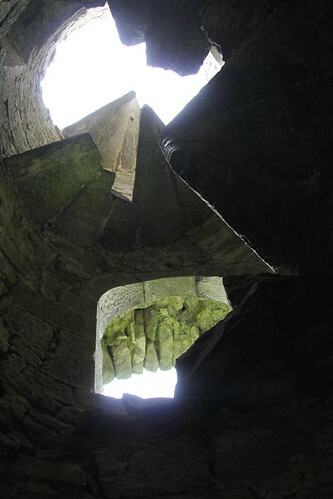 None the less, we arrived in one piece at Clonmacnoise. This is a site on the bank of the Shannon River where the very influential St. Ciaran founded a religious community in early Irish history. Throughout its history it would grow in size and importance...and then be sacked by Vikings. Eventually the monks and priests would come back, and rebuild...and then the Vikings would sack it again. Eventually even the Irish figured there was no sense in letting the Vikings have all the loot, so they started sacking it too. The English got in on the act, too. We walked through a museum that had informational stuff, as well as a few of the remaining standing Celtic Crosses in Ireland, an important archaeological preserve as its one of the distinguishing features of Irish Catholicism, and Clonmacnoise one of the first flourishings of the faith as a political entity. It remains a beautiful site, although in ruins. 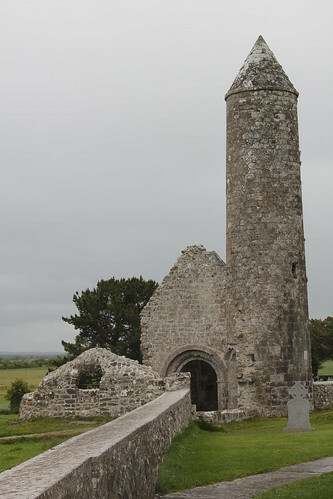 After leaving Clonmacnoise, we wandered through backcountry roads, mostly lost. 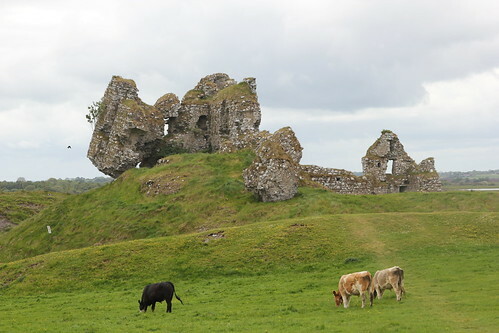 At one point we chanced on a square Norman keep in a fenced off pasture. We pulled over on the "side" of the road, which is to say, on the ribbon-thin part of the roadbed that wasn't paved. It wasn't safe, since it was on a blind curve, and the pasture was marked as private. Never the less, Herself clambered through while I kept watch on the car, and she took a few pictures. She even got inside the tower. 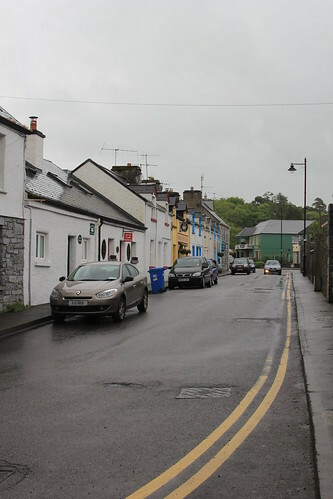 With white knuckles and frayed nerves, we drove most of the rest of the way to Cong, stopping for lunch at a little town called Headford, in an inn called "The Angler's Rest" where I had my first "bap." 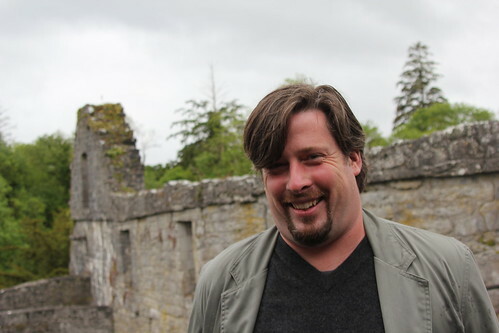 I ordered a sandwich and a cider, and in this part of Ireland, people confirmed they'd heard you by saying "Yep!" in a bright sort of manner. It was peculiar to that part of the country as far as I could tell, and interesting verbal mannerism. So I asked the tattooed, Converse-All-Star wearing waiter what a bap was when he asked "panini or bap?" and found out that a bap is a round bun, not unlike what we'd call a kaiser roll. I don't know the derivation of the word. Fortified by a little bit of food and rest, we drove the rest of the way to Cong, a picturesque and purposefully quaint village near Ashford Castle. We checked in at the Dolmen House where we were staying, a bed-and-breakfast with a large standing stone out front - the eponymous dolmen. Dropping our dunnage, we drove through those breakneck tiny roads back to Cong to wander around and get some supper. 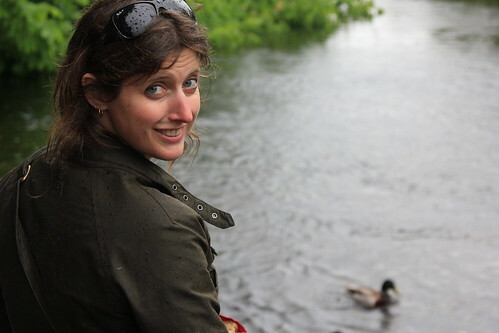 We wandered around quite a bit, and found a ruined church by a little stream, where there many ducks who were about as noisy as I've ever heard ducks be. 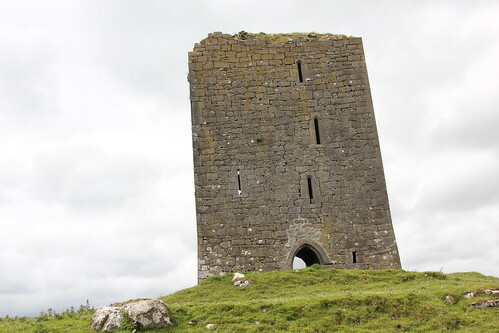 We poked around the ruins of the church, preserved in national trust and with many others everywhere dot the landscape with relics of Ireland-that-was and make a bridge to Ireland-that-is. We had a snack at a place called The Crow's Nest, which we viewed as a good sign since that was the name of the room at the Banning Lodge we'd stayed during the wedding. We shared a couple drinks and a steak-and-guinness pie, and then did some shopping. Cong is the town where John Wayne's movie "The Quiet Man" was filmed, and they are still very proud of this fact, with The Quiet Man Tavern still proclaiming this heritage, and little placards around town identifying particular spots for scenes or backgrounds. The proprietors of the shops here were very friendly and chatty, which to be honest was atypical of our experience in Ireland so far, where people had basically been standoffish. We got some wine and fresh bread from a thatch-roofed general store. 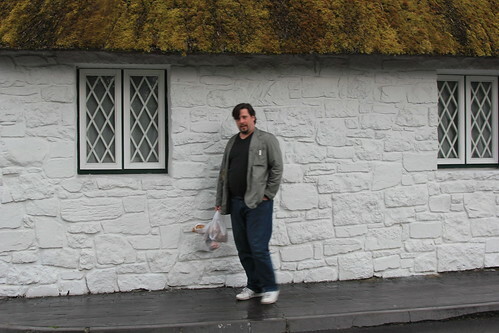 I was exhausted from my perpetual nigh-nervous-breakdown from driving halfway across Ireland, and everything in town shut down quite early, so we took our food back to the guest house, and once again read, relaxed and took it easy. I must confess that I was too much of a coward to drive in Ireland. Poor Fenryng had to do it all, as I was certain I would kill us both. You can go all day without seeing a sign, and then *bam* you are faced with this mass of confusion! I see now where all the signs in Ireland ended up.